C7, Electret Microphone from AKG. AKG presents the C7 reference condenser vocal microphone, offering a circuitry & custom-designed components adapted to live performance environments. 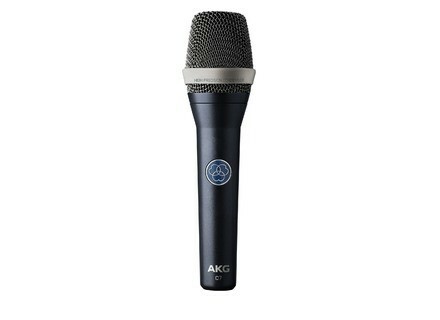 The C7 electret condenser microphone is said to incorporates a custom-tuned supercardioid condenser capsule which the AKG engineering team blind-tested in each step of the development process with the goal of creating a mic with pristine clarity and a sparkling high end that lets the singer’s voice shine through. In addition, the C7 has been designed to handle high SPL levels without distortion. The new mic is designed to eliminate handling noise through a built-in mechano-pneumatic shock absorption system. The system has a rubber layer surrounding the capsule to help insure that vibrations from the housing are not transferred to the capsule. AKG claims to have searched extensively to find the right rubber to meet the specification, ultimately working with a Viennese company to source a patented material with such strong absorptive properties that it lands completely flat when dropped. A multilayer protection system works to prevent unwanted pop noises. It consists of three layers: the grill, a foam layer behind the grill and a layer of mesh atop the capsule. The robust housing is zinc-alloy, with a spring steel grill and 24-carat gold-plated capsule. More details available at www.akg.com. [MUSIKMESSE] Genelec 8340A & 8350A In addition to two new subwoofer models, Genelec is also presenting two new monitors, the 8340A and 8350A. [MUSIKMESSE] Chandler Ltd TG Microphone Cassette Chandler Limited and Abbey Road Studios return to TG series with the Microphone Cassette, a fully featured recording channel. [MUSIKMESSE] Genelec 7360A & 7370A subwoofers Genelec introduces the 7360A and 7370A, two new subwoofer models.